Tradesmen International has been the exclusive sponsor of ABC’s National Craft Professional of the Year Award since 2005. Three years ago, Nick Marcus, General Manager of Tradesmen’s Grand Rapids construction staffing office, worked with chapter staff to create a regional C.P.O.Y award for ABC’s Western Michigan Chapter. This award celebrates a construction craft professional who excels in his or her field while also demonstrating a commitment to safety, training and the merit shop philosophy. The recipient of this Chapter award excels in his or her field while also demonstrating a passion for the trade and the satisfaction of a job well done to benefit both the construction industry and the greater Western Michigan community. These are the talented professionals who are role models for the next generation of men and women in the skilled trades. 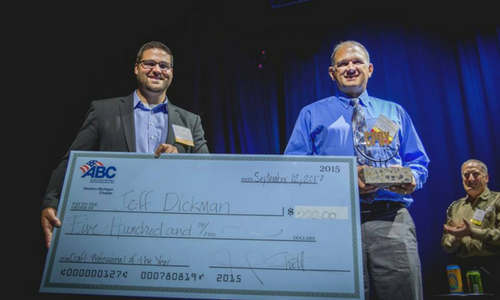 ABC Western Michigan Chapter’s Craft Professional of the Year was announced during the 2017 Excellence in Construction Awards on September 12th. Jeff was chosen from three outstanding finalists.